The book’s first softcover printing is expected late this week. It’s available to order online, as is the eBook, and stores that have stock will be posted. 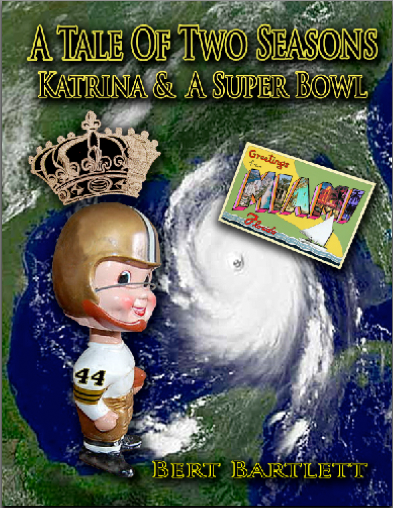 Posted in Uncategorized.Tagged A Tale Of Two Seasons, Chris Fischer, Hurricane Katrina, Katrina & A Super Bowl, New Orleans, New Orleans Saints, NFL, Pro Football, Write2grow.org. You just put the biggest smile on my face. Great to read your words, though of course I’m horribly biased. Great writing and insight, plus the personal angle. It all comes to nothing but fun. I’ve been watching Mike Singletary in interviews; the guy’s coming unglued. I see nothing but the Saints in their desperate years, from the management on down. It takes so much to make a winner, and the 49ers don’t have it. Many people are predicting an upset, and it’s not impossible. I remember the Saints beating the Cowboys; it might have been the year the Cowboys won their first super bowl. New Orleans used to have these horrible seasons where the only redeeming quality was having one or two wins that were upsets. For me the low point was the Saints being the first team to lose to the then awful expansion team of Tampa Bay, who I’m pretty sure didn’t win a game their first year, and finally pulled one out around November of the next year against the Saints. But enough about the bad memories, though they do make the present that much more special. I’ve lived in SF for 24 years. I know what great fans are. And when I moved here the 49ers were at the height of their power, and remained so for another five years or so. And since that time I have seen the most spoiled brats of fans turning on a dime to hate their team, shunning them with disgust when they’d go 10 and 6. Everyone remembers the Joe Montana years, extending into Seifert’s era with the arm of Steve Young, who was a great quarterback waiting to take over from one of the very best the game has ever witnessed. So here we sit, with nothing of the former glory years. And though people don’t want to admit it, the truth is those types of teams don’t come around often at all. If you’re lucky, you are one of 32 cities that gets a glorious organization out of its football team, and has about five, or in extremely rare occasions, eight years of extreme winning. That’s generally the trend: Dallas under Landry, Packers under Lombardi, Colts under Unitas (Weeb Eubank success extended to Shula), Steelers under Bradshaw, Patriots under Brady, and then there’s the frustration of the near dynasty of the Colts with Manning who haven’t been able to parlay their excellence into more than one national championship, due most recently to you know who. The 49ers were one of the top five dynasties in NFL history. Nobody, save Pittsburgh, has had more Super Bowl wins. This town (SF) doesn’t appreciate how special and unique it all was. They came to expect it so much, I remember after the holidays had wound down, people saying goodnight on a certain Saturday in January with “Happy Super Bowl.” In short, the 49ers and Mike Singletary are going to see the chasm between their lack of success, and the Saints proliferation of it. Who Dat! Yikes For Ya Ya !! But rite result for Mick !! Next Post David Dixon, R.I.P.